The Raspberry Pi 3 not only runs Kodi well but has built-in WiFi and Bluetooth. I have setup Kodi on a RasPi 3 and it makes for a good small Kodi box. 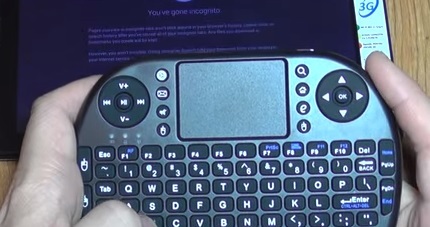 After setting Kodi up on the Pi 3 we began to test it out including using Bluetooth remote control keyboard combos. We used OpenELEC to do all the testing with and Bluetooth worked great with most all our devices. Read here for how to enable Bluetooth on a Raspberry Pi 3 Kodi setup. If you have already have a Bluetooth keyboard, or the popular mini keyboard remotes than it likely will work with a RasPi 3 Kodi setup. For those that are looking to get a nice controller here is our list of favorite Kodi Bluetooth Keyboards and remotes controls. iPazzPort makes many popular mini keyboard combos that work very well with the Pi 3 and Kodi, as well as many other setups. It has small joystick controllers and also has a built-in touchpad. Like other mini keyboards it also works with most any other setups. Jelly Comb makes this Mini Bluetooth Keyboard that has wide compatibility. The touchpad its built into the center with the keys on the outside. While small, about the size of a smartphone it has a lot built-in and works well with the Pi. 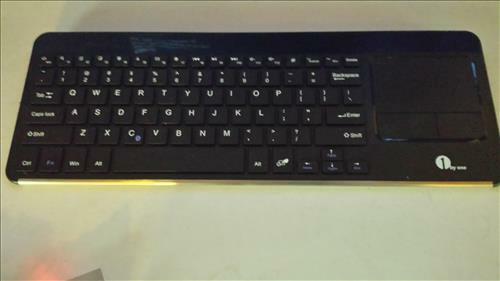 1byone makes this Bluetooth keyboard that also has a touch pad to control the mouse cursor. This is one of my favorites that I have been using since setting up Kodi previously on a RasPi 2. A video is at the bottom of the page for the setup which is easy. The buttons and the touchpad work great with the Pi 3 built-in Bluetooth. This is a good option for those who don’t want a large keyboard but don’t like the small remote keyboard combos. iPazzPort also makes this very small keyboard remote control option. 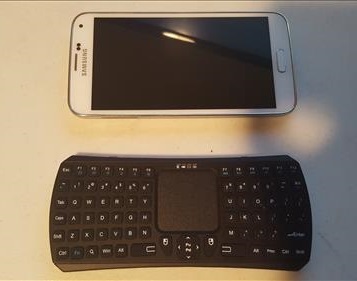 It does everything a standard keyboard will do only miniaturized. This type of small mini remote is good for those with nimble fingers. If you have large hands a mid-size unit will likley be better. The Rii K18 is a mid sized keyboard that can work with most any device including the RasPi 3. It uses a receiver dongle that plugs into a Raspberry Pi and transmits a 2.4GHz signal. Since it uses its own small transmitter it can also work with many there electronics from Windows, to an Android TV box. Setting up a Bluetooth keyboard or remote control with the Pi 3 and Kodi make for a nice home media experience. The controllers are cheap usually less than $20 dollars. Of course a wireless mouse or keyboard can also be used and it is a matter of preference. When it comes to picking the right keyboard, remote control the size of your hands will influence the type best suited for you. One person will prefer certain types that don’t work for others. As Always be sure to read the reviews on Amazon or elsewhere to be sure a unit is a good fit for you. I viewed your video, but I have one problem. Before I can connect with the bluetooth device I need away to control the Raspberry pi menu on TV screen wirelessly. I have an Raspberry pi 2 unit with Kodi 16 version and OpenELEC version 6.03 and my Android table can connect with the Rasp pi 2 wirelessly just find. But when I try to setup my Rasp pi 3 with Kodi 17.1 and use OpenELEC version 7.1, I’m unable to connect wirelessly with the Android tablet. Using the app YATSE to remotely connect the tablet to the Rasp pi 2 or 3, It always thinks the Rasp pi 3 is OFFLINE. And I have no way to remotely connect the tablet to the TV screen and the Raspberry pi 3 menu display. Has anyone experienced disconnection issues with the iPazzPort Bluetooth mini keyboard and kodi? It works fine in other is for raspberry pi as well as on my Amazon fire stick but once I fire up kodi the thing seems to disconnect in less than 2-3 seconds. I understand if it’s 15+ minutes but this seems to drop as soon as I stop typing. I had the same problem with the iPazzPort keyboard. I came to understand it’s a problem when having both the Bluetooth and WiFi enabled. You either need to use the Ethernet port on the Raspberry Pi or a keyboard with a USB WiFi dongle. Thanks for the information. I would prefer to use a full size keyboard for my RPI 3 since I use all my fingers to type. 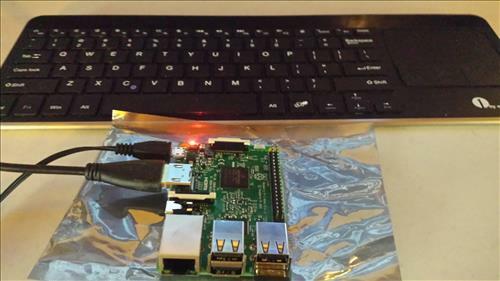 Thank you very much for sharing information about connectivity of wireless keyboards with pi 3. you have given good options rather than using large and big wired keyboards, we can use small and wireless keyboards with controls.